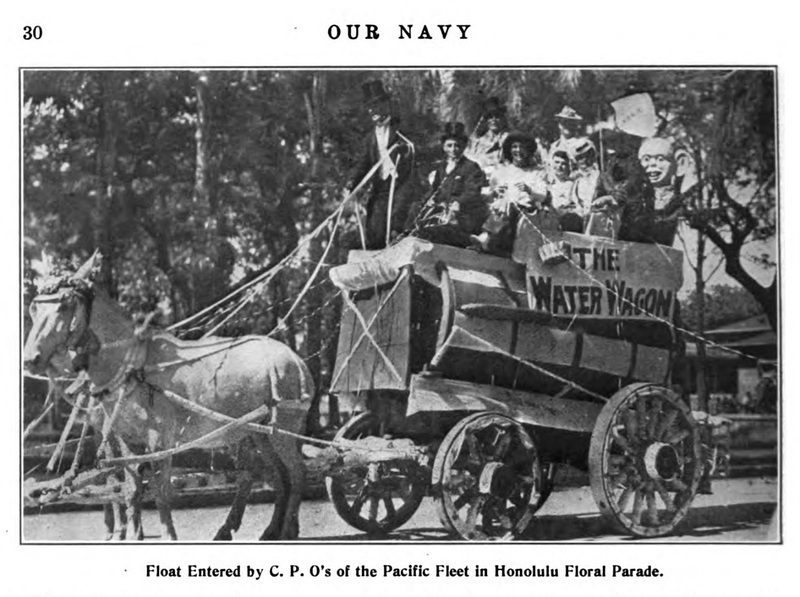 In 1911, a group of Chief Petty Officers of the United States Navy’s Pacific Fleet entered a float in the Washington’s Birthday floral parade in Honolulu, Hawaii. The float was a live-action illustration of the idiom “on the Water Wagon,” meaning to abstain from alcohol; the original form of the modern idiom, “on the wagon,” meaning to abstain from alcohol, drugs, or anything else. 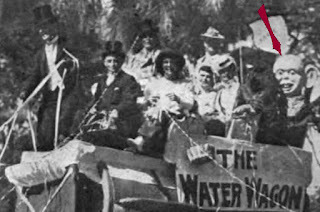 The float was also politically relevant, as the temperance movement was in full swing, with prohibition and the Eighteenth Amendment just a few years in the future. A boy/man with a large head and exaggerated ears could be seen perched at the back of the Water Wagon. Wait, what? 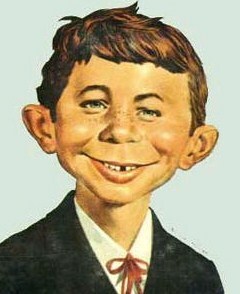 Is that Alfred E. Neuman? 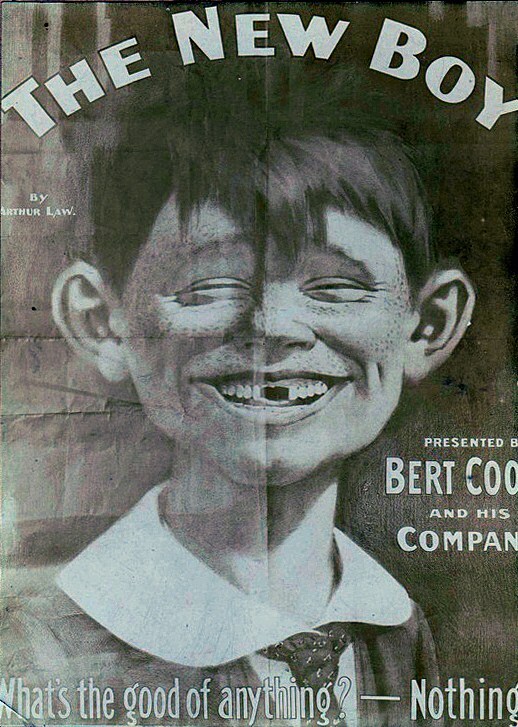 Fifty years before Mad Magazine? Mad Magazine borrowed its enigmatic, red-haired mascot from a postcard in the 1950s. 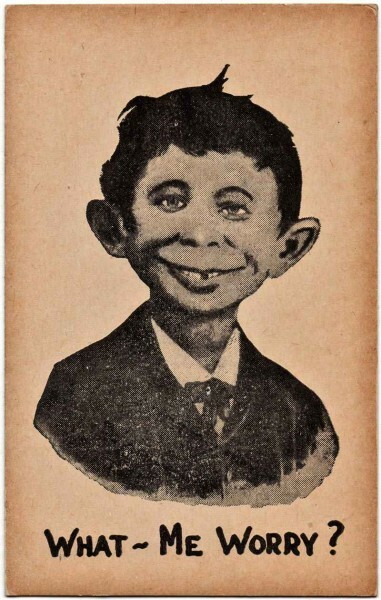 The postcard, in turn, descended from a long line of precursors . . .
. . . all of which stole directly from Harry Stuff’s 1914 poster “The Eternal Optimist,” which also bore the caption, “Me – worry?” a precursor to Alfred E. Neuman’s catch-phrase and a reflection of the “I should worry!” craze that swept the United States for several years beginning in about 1910. 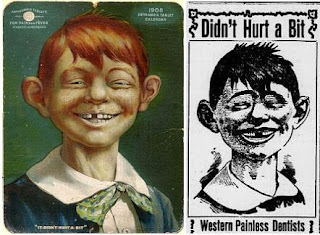 Harry Stuff’s poster may have been inspired by a decades-old advertising image usually used to promote “painless” dentistry. 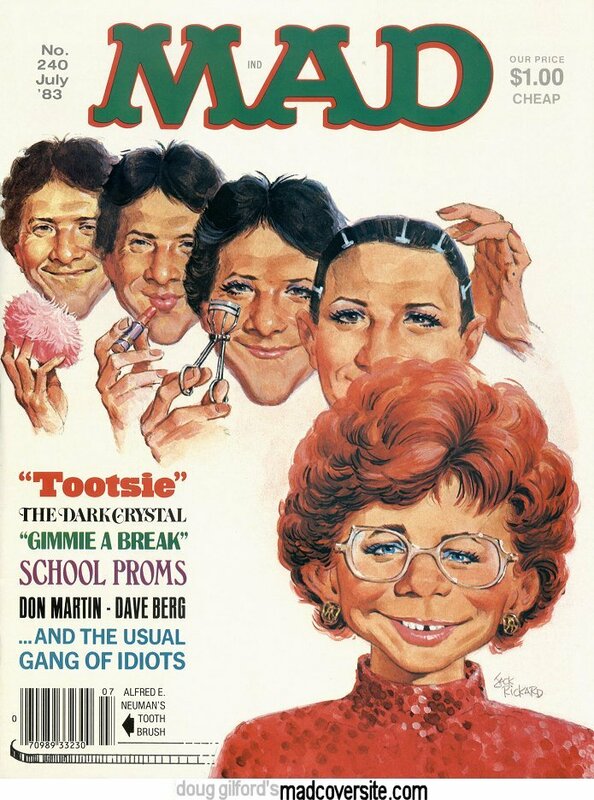 Like Harry Stuff’s poster and Alfred E. Neuman, the poster featured a two-part, noncommital catch-phrase, “What’s the good of anything? Nothing!” suggesting, perhaps, that Stuff may have been familiar with the original. Based on an image from, NYPL Digital Archive. 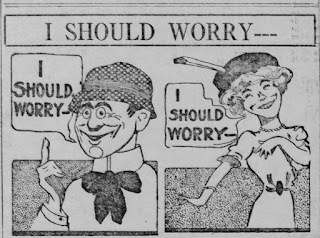 If Harry Stuff’s “Me – worry?” caption was influenced by the original, it was also influenced by the popular slang phrase of the day, “I should worry,” meaning more or less that the speaker has nothing to worry about. Eugene O'Growney, Simple Lessons in Irish, Dublin, Gaelic League, Part II, page 16, 1897. It’s not an exact match. The ears are too big, and it’s missing the gap-toothed smile, but its similarity combined with its worry-related catch-phrase, make it an interesting cousin of Alfred E. Neuman, if not a direct ancestor. 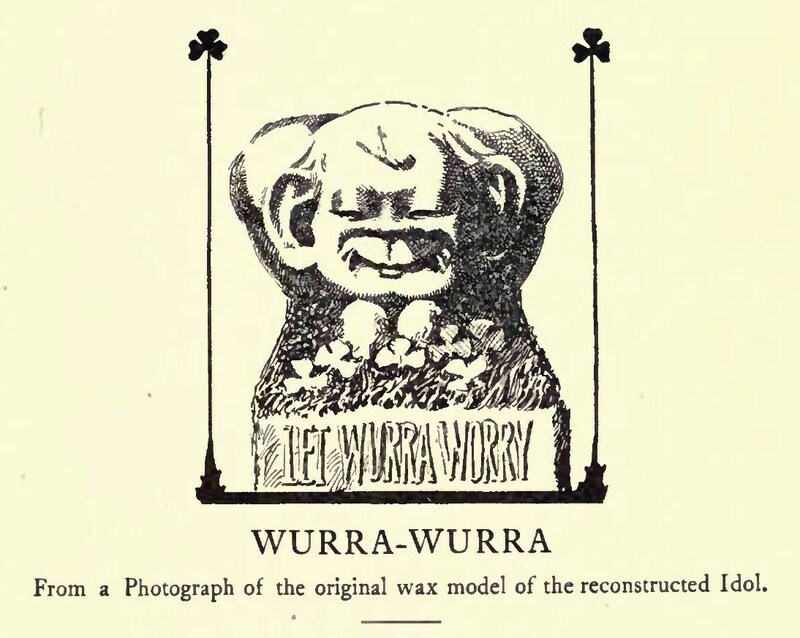 But regardless of its relation to the “New Boy” and the painless dentistry ads, Wurra Wurra was also a direct knock-off of an earlier, more successful mock-god – the Billiken. 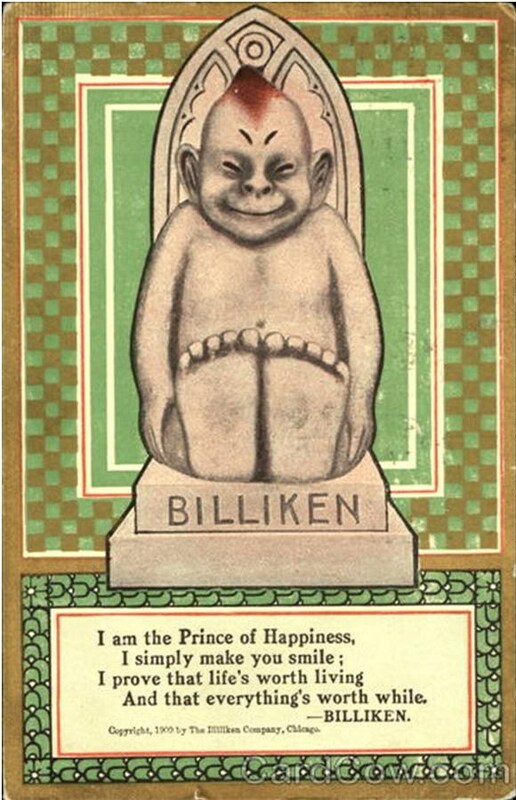 In 1908, Florence Pretz of Kansas City created a small statuette she called the Billiken. 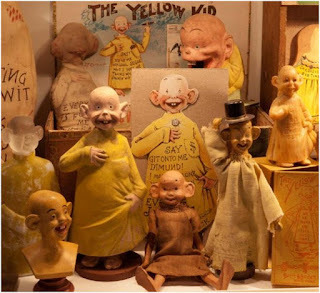 She also developed a mock-religion based on “worship” of lucky Billiken idols; with Billiken as “the god of things as they ought to be.” Billiken caught the fancy of the public, and she and her business partners sold millions of the idols and separate display stands; proof positive that Billiken was a bringer of good luck. Good luck, maybe, but not for long. To Miss Pretz they mean $30 a month royalty while thousands go to the bank accounts of the men who have involved the designer in a maze of technically worded contracts and agreements not understood when she signed them. Iron County Register (Oronton, Missouri), December 2, 1909, page 7. 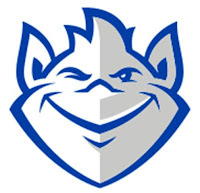 Although the fad has long since passed, the Church of Good Luck and Museum of Good Luck still preach the gospel of Billiken online from their home base in Illinois. 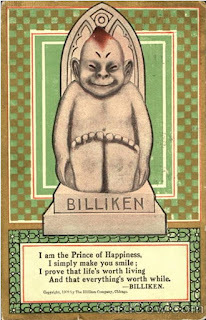 See their website for Billiken images, Billiken lore and Billiken history. 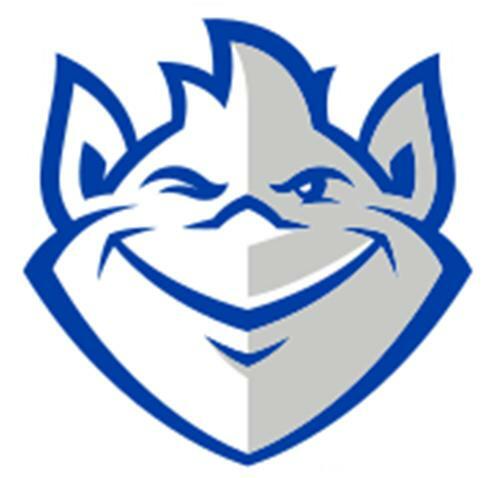 The success of the Billiken inspired imitators. In Paris, France, someone created a “Billiken” of Wilbur Wright. 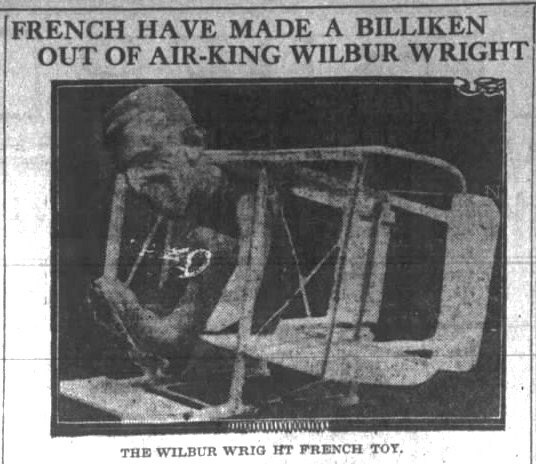 Wilkes-Barre Times Leader (Wilkes-Barre, Pennsylvania), December 2, 1908, page 2. 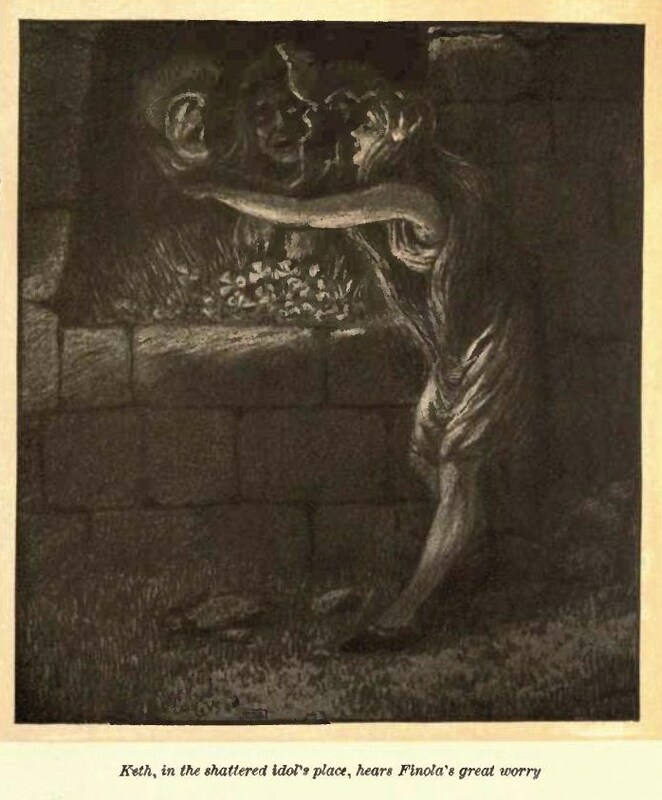 In London, England, the American artist Mrs. Bert Longworth (whose replica of the Sphinx was praised by Rodin) created and marketed a statuette of Solomon. London, Jan. 21. The reign of the Teddy bear is over and gone in London, Billiken, that pestiferous little reminder of things as they are, and his brother, whose apelike grimace is supposed to suggest the god of things as they ought to be, are alike hurled from the precarious pedestal of public favor. Another American “freak,” Solomon, has taken their place. . . . Every paper has printed his picture, every bric-a-brac shop and every department store is crowded with his haunting shape. So far as Londoners achieve a “rage,” Solomon has become the rage of the present. The Indianapolis Star, January 22, 1911, page 15. The Star Press (Muncie, Indiana), January 22, 1911, page 24. 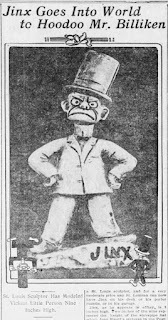 In St. Louis, Missouri, someone came up with a bad luck idol – Jinx – based on a newspaper cartoon strip of the same name; kinda like a top-hatted Homer Simpson. Jinx has taken his place beside Billiken. 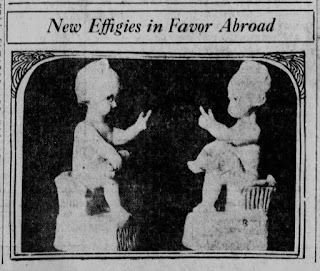 The little god of things as they ought not to be has been done in plaster by a St. Louis sculptor, and for a very moderate price any St. Louisan can now have Jinx on his desk or his parlor mantle, or in his garage. 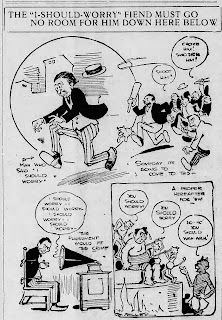 St. Louis Post-Dispatch, August 29, 1911, page 3. “Yis, yis, yer ‘anner. What’ll I do? Och wurra, wurra! Me husband’s tuk bad, sir, wid the fayver and I’m afeerd I’ll lose him. The Brooklyn Daily Eagle, March 13, 1849, page 1. 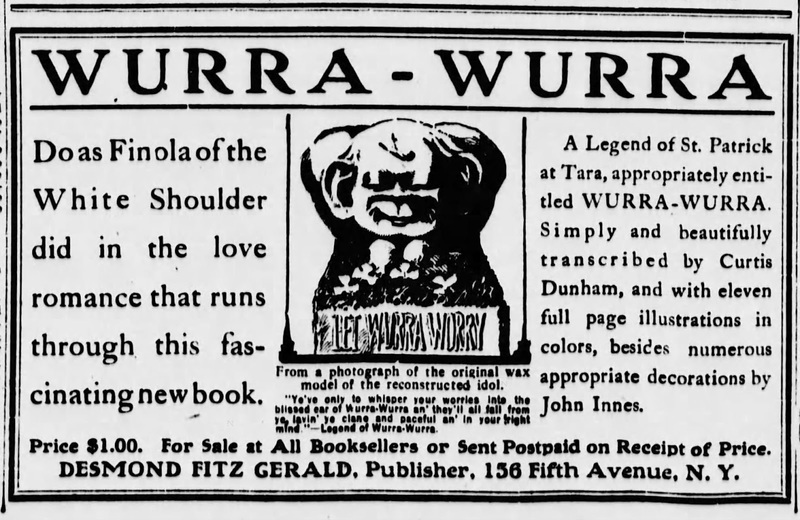 In March 1911, Desmond Fitz Gerald published the book, Wurra-Wurra; A Legend of Saint Patrick at Tara. 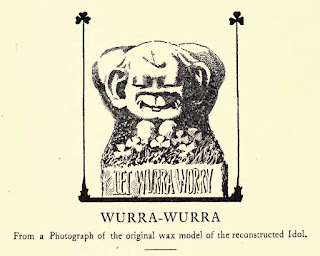 The Wurra-Wurra of the title referred to the name of the supposed last pagan idol destroyed by St. Patrick during the Christianization of Ireland. 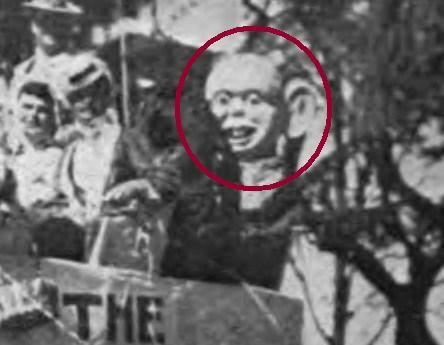 The booked appears to have been designed to imbue the Wurra-Wurra idol with some vague, mystical significance, as was the case with the Billiken. Instead of bringing good luck, however, the Wurra-Wurra, like Jesus suffering for our sins, was said to ease worries by taking them on himself. 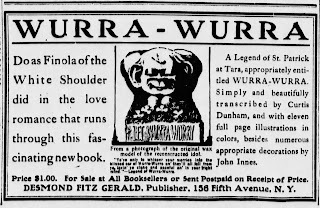 Presumably, Fitz Gerald intended for the book to create a market for his Billiken-like statuette of Wurra Wurra. The ears, teeth and proportions appear similar to the head riding at the back of the “Water Wagon” in Honolulu in 1911. It’s not a perfect match. The eyes seem different. Is it a Wurra-Wurra that differs slightly from the illustrations, or something else entirely? Perhaps it was an old “Yellow Kid,” a newspaper cartoon character who enjoyed a period of overwhelming popularity a decade earlier? 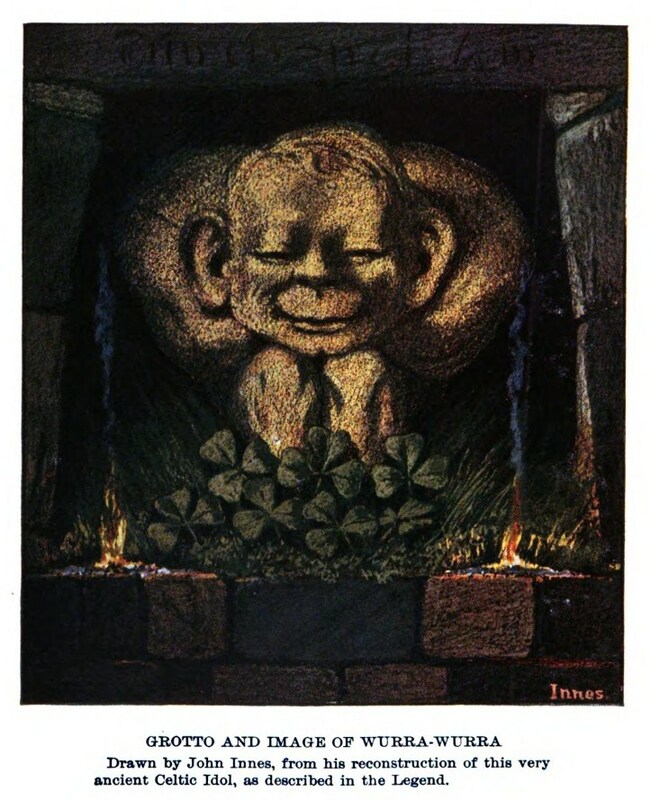 Like a Mad Magazine movie parody, Wurra-Wurra; A Legend of Saint Patrick at Tara is a send-up of a pre-existing story, in this case the legend of St. Patrick in Ireland. But whereas Irish legend holds that Crom Cruach was the last pagan idol in Ireland, the destruction of which cleared the way for Christianity, this story imagines (like Star Wars Episode V) that there "is another" (although this time more Yoda than Leia) – Wurra-Wurra. [T]he face and figure of the idol, an’ his wide opin ears foriver listenin’, themselves told the whole story – not only that it was his business to bear all the worries and troubles of the world, but that he liked the job! 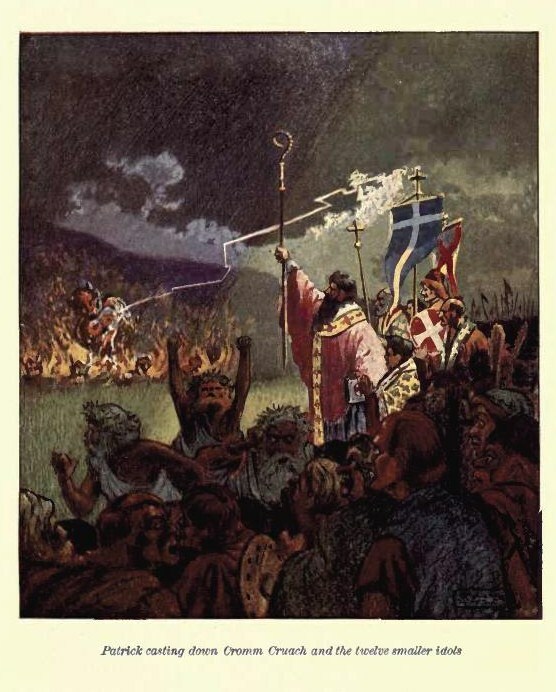 In the aftermath of the destruction of Cromm Cruach, according to the new story, Keth, one of St. Patrick’s Christian enforcers, is dismayed to learn that one of St. Patrick’s seamstresses, “Finola of the White Shoulders,” was an adherent of the cult of Wurra-Wurra. He asks her about it, she confides in him, he falls in love with her, and they go off to see the Wurra-Wurra. 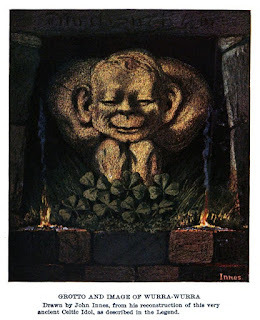 To make a short story even shorter, St. Patrick decides that the idol should be saved, but word reaches Keth after he destroyed the idol (all but one of its ears) during a confrontation with a wizard. 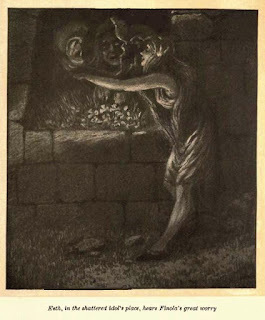 To prevent Finola and other worshipers from discovering the destruction and taking their anger out on him, he places his head on the pedestal where Wurra-Wurra’s head should be, miraculously fooling them into confessing their worries to him. As a result, he inadvertently learns that Finola returns his feelings of love, they get married and live happily ever after. 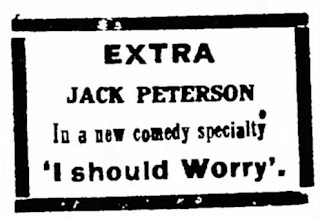 The earliest unambiguous example I could find in print is from an advertisement for a comedian in 1910, although it is unclear whether he popularized the expression or merely reflected a trend that was already underway. The expression may have been current before it was incorporated into Peterson’s act, but searches are complicated by the fact that people routinely used “should worry” in its conventional, literal sense. If you find any earlier examples, please let me know. 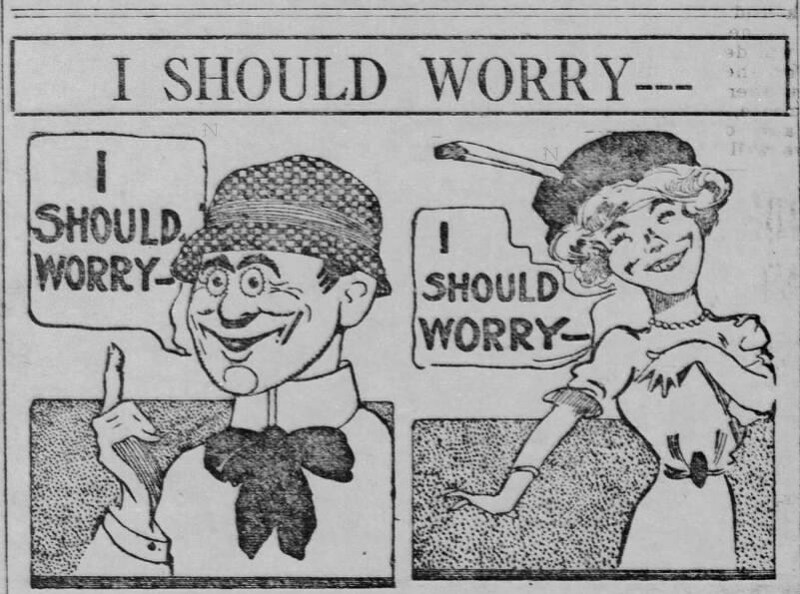 “I should worry” shows up in print a few times in 1911, and exploded into a full-blown craze by 1912. It was still going strong in 1913 . . . I should marry a suffraget! But nevertheless we’re getting the vote! Evansville Press (Indiana), June 28, 1913, page 2.
. . . although many people were already getting annoyed. 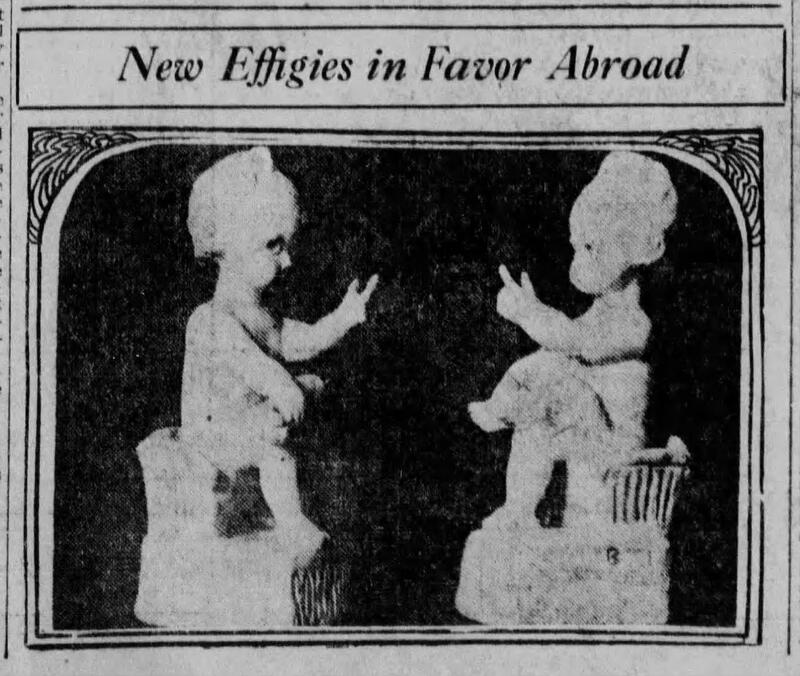 The Daily Missoulian (Missoua, Montana), May 24, 1913, page 10. Alfred E. Neuman is the only reminder of “The New Boy” of 1895 . . . 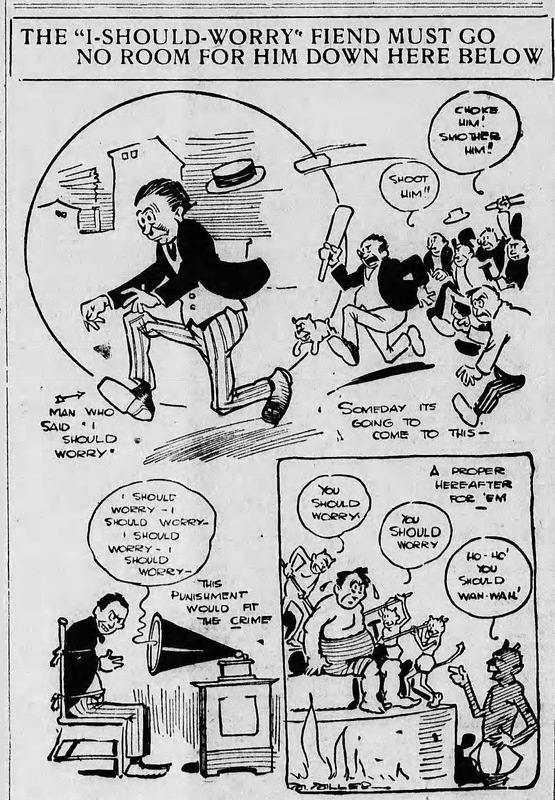 The St. Louis University Billikens are the last holdouts of the Billiken craze of the 1900s . . .
. . . and “What, me worry?” is the last vestige of the “I should worry!” craze of the 1910s. 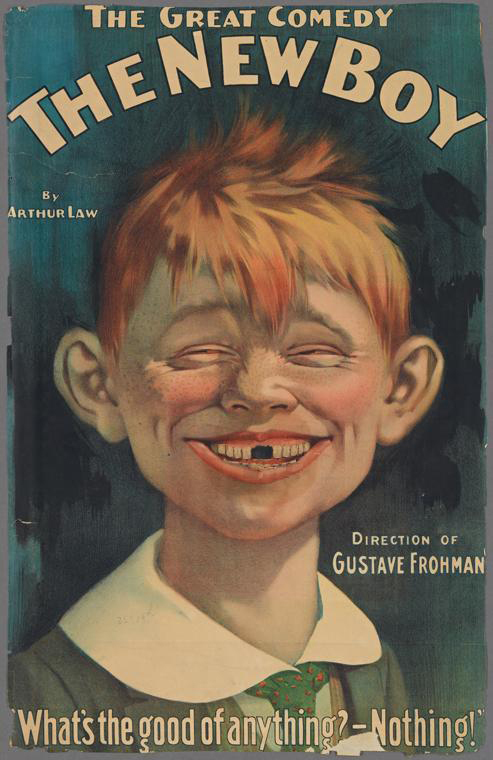 In my earlier post, The Real Alfred E., I traced the history of Alfred E. Neuman's image back to a poster for the stage play, The New Boy, by Arthur Law and directed by Gustave Frohmann, which debuted at the Standard Theater in New York City, on September 17, 1894, after a successful run in London. 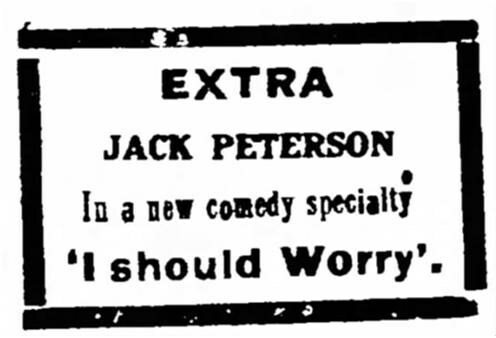 In that post, I was only able to provide black-and-white images from newspaper advertisements, a black-and-white parody of the original poster, and a severely faded image of the poster for a later touring company. I was unable to find any images of the original poster. 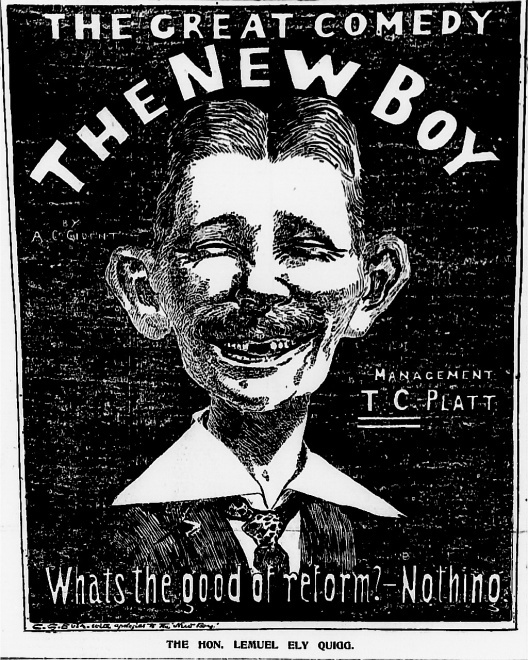 "The New Boy" - Original New York Production Poster. Poster for Bert Coote's Touring Company - no earlier than 1895. 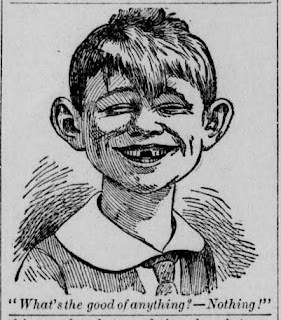 New Boy Ad - Los Angeles Herald, December 2, 1894. Political Cartoon - The Evening Telegram (New York), September 22, 1894. 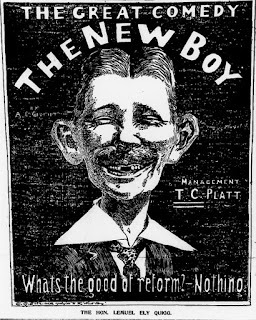 James T. Powers - as "The New Boy". James T. Powers - as "The New Boy"
As I noted in my first post, Willis Searle is one of the original Alfred E. Neumans. He was the first actor to play the role of Archibald Rennick in The New Boy in the United States. 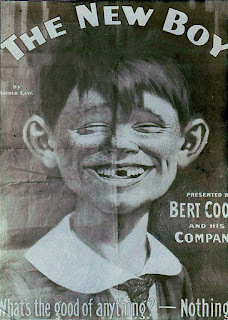 The image of Archibald Rennick on the advertising poster for The New Boy is the original Alfred E. Neuman-like image. Willis Searle was also the punch line in a poem about a cross-dressing soldier before his debut in The New Boy. Their sweetest songs to the list'ning flowers. She met and kissed me 'neath the stars. Whenever a leaf by the wind was stirred. And set by demon hands alight. "You dream of some one at home, I guess." To find on my breast its resting place. And hid in my heart her dying prayer. That Willie Searles and my girl were one. You're the first l've told – the story's new. The poem was disguised as a romantic ode to a soldier’s sweetheart, Bessie. It tells of a soldier on late night guard duty. It recounts in sweet, tender, loving detail how his partner on guard duty reminds him of his hometown sweetheart, Bessie; his slender figure and a girlish face seem so out of place in the army. Only after the partner is tragically shot and killed by a sniper in the middle of the night does he realize that his buddy, “Willie Searles,” actually IS his sweetheart from back home. The poem appeared in the National Tribune on September 18, 1894. The National Tribune was a newspaper that specialized in news and information for members of the Grand Army of the Republic (GAR) and its women’s auxiliary, the Relief Corps. The GAR was a fraternal organization for Union Army veterans of the Civil War. The poem appeared, specifically, in the section of news related to the Relief Corps. The poem was reportedly reprinted from another newspaper, but the source and the author are not named. The poem was provided by Kate B. Sherwood and Emma D. Sibley, the President and National Secretary of the Relief Corps, respectively, in a bundle of news items dated September 8, 1894. They present the poem as a “beautiful story, sweetly told.” They appear to have been oblivious to the underlying humor. It is likely that most of their readers were also oblivious to the cross-dressing reference to ‘Willie Searles.’ Willis Searle was an Englishman who was brought to America to play the role of Archibald Rennick in The New Boy. The New Boy premiered in New York on September 17, 1894, one day before this poem was published in The National Tribune, but nearly two weeks after the date on which the President of the Relief Corps sent the poem to the newspaper. It is therefore likely that most of the readers were unfamiliar with Willis Searle and his background as the cross-dressing star of Charley’s Aunt on the South African stage. The role of Charley’s aunt is a cross-dressing role. Charley’s college chum poses as his rich aunt from Brazil who is in town for a visit. Although Searle would later tour the United States in a production of Charley’s Aunt, he does not seem to have performed that role in America before the poem was reprinted in The National Tribune. Charley’s Aunt premiered in London in 1893. Willis Searle’s performances in the role in South African would therefore have taken place sometime during 1893-94. Coincidentally, or not so coincidentally, the British South Africa Company was fighting the First Matabele War against the Ndbele (Matabele) Kingdom during 1893-94. The original source of the poem may well have been a British soldier serving in South Africa during that period. The humor of the line was probably lost on the President and Secretary of the Relief Corps of the GAR in September, 1894. 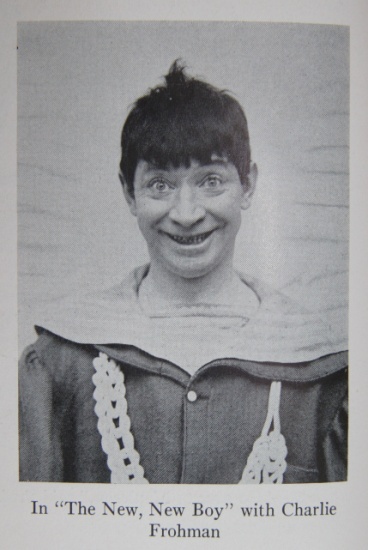 Due to poor reviews, Willis Searle was fired from The New Boy within weeks of his debut and was immediately sent out on a national tour of Charley’s Aunt. 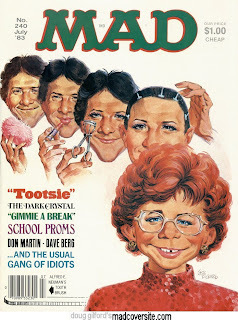 Assuming for the moment Willis Searle was the original Alfred E. Neuman, Alfred E. Neuman would not appear in drag again until his appearance as Tootsie on the July 1983 issue. 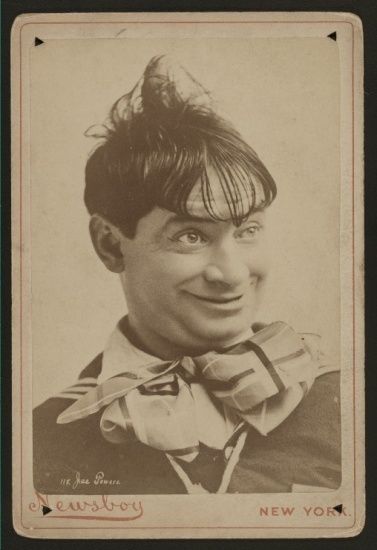 Of course it is also possible that The New Boy poster image was based on Weedon Grossmith, who originated the role in London, or James T. Powers, who popularized the role in the United States, or Bert Coote, who toured throughout the United States and Canada in the role for years. 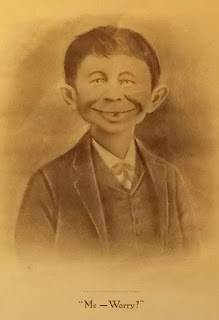 It is also possible that Alfred E. Neuman’s face was altered from the original; James T. Powers, for example, bears a greater resemblance to Alfred E. Neuman than he does to the original The New Boy poster. For the whole story, see my original post, The Real Alfred E.
For his part, Willis Searle was back in England by July 1895. According to William Archer, The Theatrical ‘World’ 1895, Searle performed two roles at the Avenue theatre in London in 1895, The Private Secretary (September) and Mrs. Ponderbury’s Past (November), before falling off the radar.